Is It Really Important to Stabilize the Public Debt? And, If So, When and At What Level? Share the post "Is It Really Important to Stabilize the Public Debt? And, If So, When and At What Level?" 3 comments in reply to "Is It Really Important to Stabilize the Public Debt? And, If So, When and At What Level?" GDP growth is easily divided into productivity and population growth. Productivity growth might depend slightly on unemployment due to hysteresis (people losing skills), but there is really only so much you can do to target the denominator in the debt equation. Also note that GDP may be somewhat dependent on inequality so the number becomes inflated and recent productivity growth may have been overstated (firms understating hours for people working overtime might be a reason for overstatement of productivity growth during the last few years, but I’m talking about a longer timespan). It is true that working less would lower the denominator in the debt equation (especially if inequality does inflate the official real GDP), but it would also lower the deficit and so improve the long-run debt ratio. The average person might dislike deficits simply due to inflation. It messes up contracts and things which assume a low rate of inflation, as well as the cost of pennies. And tying contracts to inflation can lead to cases like Brazil where this just let the government spend even more. But ignoring that. As a matter of policy and if people changed how they thought about inflation and money, consider what happens if all government spending is “useful”. There would no need to be concerned about excessive government spending if it really does compete with private spending. The phenomenon of ‘overheating’ at low unemployment is really just due to too much money in the economy (inequality) and insensitivity to prices, so ignoring that too, we could conceivably have the government being limited in its spending simply because it doesn’t pay enough to fill all open job openings. People would prefer the private sector at the margin. the BIS wants us to issue more debt, irregardless; per BIS: “the purpose of government debt is not to fund government spending. It is to provide safe assets.” The BIS proposal for ensuring the supply of global safe assets in effect treats currency-issuing governments – especially the US – as the world’s savings banks. 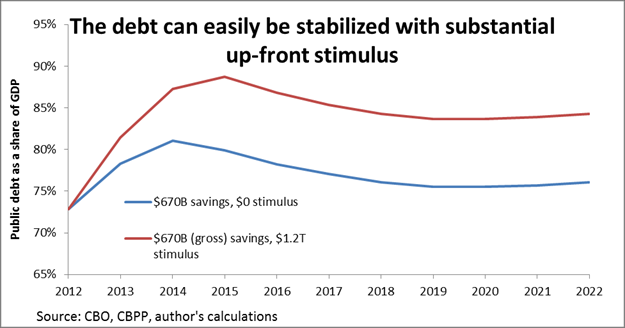 Disregarding the politics, economic conditions make an overwhelming case for stimulus. Additionally, since the economy is under performing by more than $1 trillion, and we are faced with a Japan like lost decade (already half way there), it pays for itself. The accelerated increase in GDP creates enough extra tax revenue in a few years to cover the cost of the stimulus. That’s without considering the savings from borrowing now at low rates for infrastructure, or savings from rehiring teachers instead of having them collect unemployment. That’s also discounting the fact we wouldn’t mind 3 to 4% inflation, further reducing government and consumer debt, and aiding exports. Moreover, the debt is mostly money we owe ourselves, in real terms (66%) and relative terms (Krugman, net foreign debt about 3 to 4%, .11 *.34). The case for prolonging this recession in order to prepare for a possible future recession is weak, to say the least. Consider starting the y axis on your graph at 0. Should households owe $106,000 or $120,000? (75% vs 85%) I think the $14,000 investment will pay for itself many times over.